Our Consumer Platform enhances customer’s ad content with rich media experiences, including interactive videos, games and augmented reality. 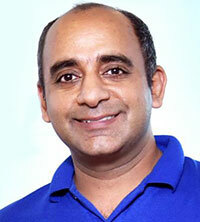 Anuj Khanna Sohum, Chairman, Managing Director and Chief Executive Officer of the Affle (India) Limited. He completed a bachelor’s degree in computer engineering from the National University of Singapore. He has also completed the Stanford Executive Program from Graduate School of Business, Stanford University and the Owner/President Management Program from Harvard Business School. While at NUS, he co-founded Anitus Technologies Pte. Ltd. and Seclore Technology Private Limited. What is Affle’s core preposition? We are a global technology company with two business segments: (a) our Consumer Platform, which comprises of (1) our proprietary consumer intelligence platform that delivers consumer acquisitions, engagements and transactions through relevant mobile advertising (“Consumer Platform”) and (2) our retargeting media business for e-commerce companies along with our push notification offerings for e-commerce companies on a software as a service model (“Vizury Commerce Business”); and (b) our Enterprise Platform which primarily provides end-to-end solutions for enterprises to enhance their engagements with mobile users. Our Consumer Platform enhances customer’s ad content with rich media experiences, including interactive videos, games and augmented reality. This paired with data-centric scientific targeting and retargeting enables a higher likelihood of consumer engagement, such as downloading an app or completing a transaction. It aims to enhance returns on marketing spend by delivering contextual mobile ads and reducing digital ad fraud while proactively addressing consumer privacy expectations. Tell us more about Affle. Affle started its business in India in 2006. Today we have five offices located in Gurugram, Mumbai, Bengaluru, Singapore and Jakarta and have customers spread across countries like India, North America; Europe; South East Asia; Middle East and Africa; and Japan, Korea and Australia. During this journey, Affle Holding Pte Ltd. has won the trust of several notable investors, such as Microsoft, D2C Inc., Bennett Coleman & Co. Ltd. and Itochu Corporation. We have a robust patent portfolio with three patents to our credit in the areas of consumer acceptable advertising and one patent pending in the United States while in India we have seven patents covering various algorithms of digital fraud detection and two patents pending in the fields of partner pixelling for user identification and push notifications for price change alerts. How is Affle differentiated from other players in the sector in India? According to Frost & Sullivan, we are a leading ad tech solution provider in India. As at March 31, 2018, our Consumer Platform had approximately 431 million consumer profiles in India. We provide services across the value chain in digital advertising, spanning the areas of DMP (data management platforms), DSP (demand side platforms)/ SSP (supply side platforms), fraud detection and ad network. We are one of the very few companies that have products spanning over the entire value chain. Further, we have increased the breadth of our service offerings, especially to e-commerce companies, following the acquisition of Vizury Commerce Business recently. (Source: “Industry Insights on the Advertising and Ad Tech Market”, dated July 12, 2018 prepared by Frost & Sullivan). The Indian market presents high barriers to entry, given its unique challenges such as a disjointed demographic, which is just getting habituated to digital applications (such as the use of e-commerce, digital payments, etc.) and low CPCU (Cost Per Converted User). In the last two calendar years, only about 25% of all Internet users in India have shopped online. Frost & Sullivan believes that this makes it more challenging landscape for marketing tech to be able to discern the users who have the highest propensity to transact online. India can be a hard market to sustain, even for market participants who are globally successful. The range of CPCU in India is quite low compared to the global market. Frost & Sullivan believes that achieving profitability in such a price-sensitive market is possible only for companies that are familiar with the dynamics of consumer profiles and have a track record of working alongside brands locally for years. (Source: Frost & Sullivan Report). Therefore, we believe our extensive consumer profile data, proprietary technology and local knowledge makes us better placed compared to global peers to deliver profitability in India. Tell us about the acquisitions by the company in this calendar year? We acquired Markt in March 2018, which had an offline to online (O2O) commerce platform through which we have enhanced our platform propositions for e-commerce companies. Effective September 1, 2018, we acquired the Vizury Commerce Business that has increased the breadth of our service offerings, especially to e-commerce companies. As a result of this acquisition, we have got the opportunity to bring business synergies with Vizury Commerce Business and our consumer platform. In addition, it has strengthened our foothold in Middle East and Africa market as it has a good clientele in these markets for retargeting and push notification offerings on a software as a service model (SaaS). We plan to continue to acquire businesses, assets and technologies that complement our existing capabilities, revenue streams and marketing presence. Tell us about your partnership with IMDA. We have recently partnered with IMDA (Infocomm Media Development Authority of Singapore) to strengthen our platform with Cloud Native Architecture and support IMDA’s blockchain initiatives. We will support IMDA by providing it a touchpoint to raise its needs and concerns to the relevant stakeholders and closely work together on strategies to support adoption of Cloud Native Architecture amongst Singapore-based enterprises. Apart from this, IMDA has also accredited our mTraction CDP platform which is an end-to-end user data, intelligence and engagement management platform for enterprises across multiple sectors and industries. Its data analytics suite enables insights on usage analytics, marketing attribution and utilizes these for rules-based customer engagement to maximize the return on a customer’s marketing spend. It gives us immense pride, as it makes us one of the companies in our domain to be accredited by a government body based on the assessment of security, reliability, usability and maintainability of the products/ platforms/ processes.